Fondriest Environmental is excited to announce the release of Solinst’s newest product: the Levelogger Edge. 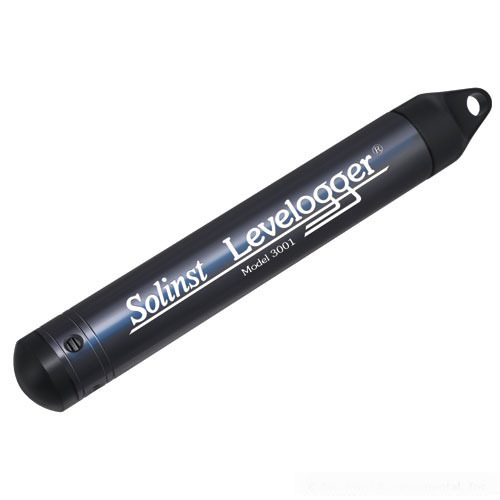 The stainless steel Levelogger Edge is a water level and temperature logger that features a Hastelloy pressure sensor and titanium based PVD coating for increased corrosion resistance. This allows for more stable and reliable readings in extreme pressure and temperature conditions, which may range from -50 to 50⁰ C. With a wider temperature compensated pressure range and improved thermal response time, the Edge can withstand over two times the normal pressure without causing any damage to the logger. The Levelogger Edge records up to 120,000 data points using the compressed linear sampling option; measurement rates can be set from 1/8 second to 99 hours. At a sampling time of 1-minute, the logger’s lithium battery life will last at least 10 years. The high resolution of previous Solinst loggers is maintained at an accuracy of 0.05% full scale. The Edge also features a protective Faraday cage design to safeguard from power surges or electrical spikes caused by lightning. It is ideal for stormwater run-off monitoring, aquifer characterization, stream gauging, along with numerous short- and long-term applications. Integration into any system is simple with this new reliable, low maintenance, and high accuracy levelogger. The Levelogger Edge communicates with the user PC through Solinst’s new Optical Reader, increasing the speed at which data is received to 34,800 bps. Other communication options include RS-232 and SDI-12 for customized applications. To learn more about the Solinst Levelogger Edge, contact a Fondriest Environmental product specialist at 888.426.2151 or customercare@fondriest.com.